So the second and final part of Series 4 of Luther is done and well, it’s hard not to feel a little shortchanged. There’s been chatter about a movie and given that we only got 2 hours of screentime here, it’s hard to see why creator Neil Cross and star Idris Elba opted for a single two-parter split over two weeks as opposed the fiercer energy that a feature-length epic would surely have borne. Episode 1 aired last week and did a decent job of pulling us back into the world of DCI John Luther, delving back into the show’s mythology and the tangled web of his own past but also moving forward with the dastardly exploits of a new serial killer, which proved to be the main hook for Luther’s return from semi-retirement. Part Two continues the blend, as John Heffernan’s marvellously malevolent cannabalistic killer continues his rampage and Luther deals with the past impinging severely on his present. 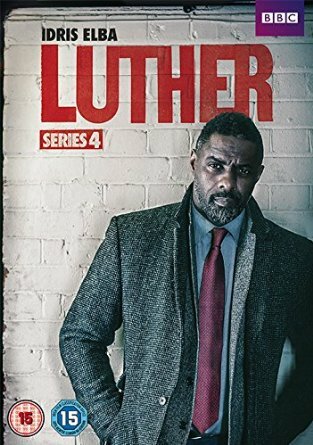 The mix of dark humour and dark criminality that has been Luther’s trademark is ever-present and worked well again here, mordantly comic lines trip off Elba’s tongue so effortlessly that you always forgive the more extravagant flourishes (like kyboshing two would-be motorcycle assassins with a metal dustbin…). And there’re interesting touches in the way the crucial cold case and gangster connections play out, Patrick Malahide giving good value for money here, toying with Luther’s fluid concept of morality. That said, featuring Alice Morgan so heavily without actually getting Ruth Wilson back on screen felt like a misuse of the limited time here, Rose Leslie’s Emma ultimately quite shortchanged in terms of character development aside from proving a little too susceptible to abandoning her police training for Luther’s reckless ways. And Heffernan’s Stephen Rose remained relatively unexplored, beyond his gruesome crime committing at least. So good to welcome Luther back, even if its brevity was a little frustrating. And with Idris Elba’s movie career going great guns, we should get used to these diminishing returns (each series has been shorter than the last) but maybe they’ll go for the big splash with the next series, which by this very logic should just be one (feature-length) part long, whether in cinemas or on TV again.